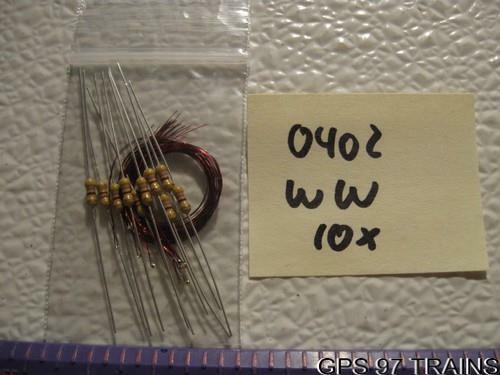 Item: SMD LED 0402 Color Copper Coated Wire "Neon White, Warm White & Red"
Special Features: At 1.5mm square it is the second smallest LED and my personal Favorite as the this size fits all my needs. These have a very thin color coated copper wire and thus fit into loco's real well. After you add the resistor it will allow 12 - 18V. I have used these for replacement lights in my loco's since they reassemble a bright output and a clear illumination. Also they are really great for illuminating the track since you hardly can see them. I am certain there are many other applications for them. Please see the pictures for detailed info. Shipping & Packing: I will wrap the item in tissue and then seal it with bubblewrap prior to placing it in its shipping cradle. This is the only way to assure the delicate item will not be damaged during the travel to its new home. I am happy to answer any questions that might arise, please just contact me. I will combine shipping on all my listed items won or purchased in my store within 14 days as applicable. !!!!!!!!!!!!!! I am not responsible for any Import Taxes or Fee's in foreign Countries !!!!!!!!!!!!!!!!!!! Z - Marklin 8975 Arch Girder Bridge 8 5/8"